What is an English Golden Retriever | GoldWynn's Golden Retrievers. The English Golden Retriever is the best dog breed you can get, no matter whether you want a family dog, competitor, therapy dog, service dog or your childs best friend.. You cant find a more awesome wonderful breed than English Cream Golden Retrievers. The first Golden Retrievers have its roots in Scotland. In the mid eighteenth century, wildfowl hunting was very popular among the rich. In Scotland a dog was needed that could retrieve from water and land because it was covered in ponds and rivers. Early retrievers were crossed with the best of water spaniels giving birth to the dog we know as the Golden Retriever. They were historically developed as gun-dogs to retrieve shot waterfowl such as ducks and upland game birds during hunting and shooting parties.They were named retriever from their ability to retrieve game undamaged and have an instinctive love of water.Golden retrievers have a dense inner coat that provides them with adequate warmth and a water repellent outer coat that lies flat against their body.The official color of the breed is the varying shades of gold that are most often seen. These dogs are well suited to suburban or country environments. 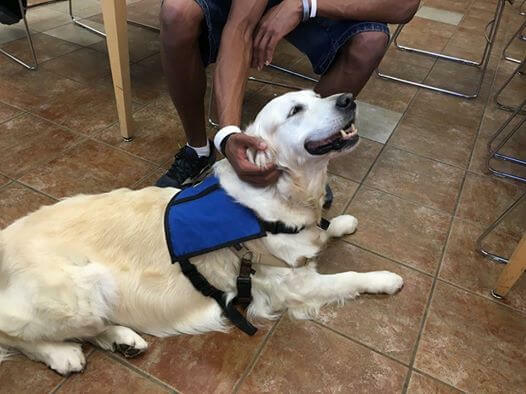 The Golden retriever’s intelligence gives them the ability to be versatile and play a variety of roles including guide dog for the blind, hearing dogs for deaf people, hunting dogs, illegal drug detector, and search and rescue dogs participant. The temperament of the Golden Retriever is a hallmark of the breed and is described in the standard as kindly, friendly and confident. 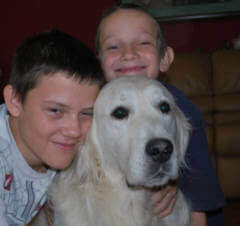 Golden Retrievers are great family pets and get along great with children. They are not a one man dogs and are generally equally amiable with both strangers and those familiar to them. The English Golden Retriever is also noted for their intelligence, being one of the brightest dogs ranked by obedience command train-ability. 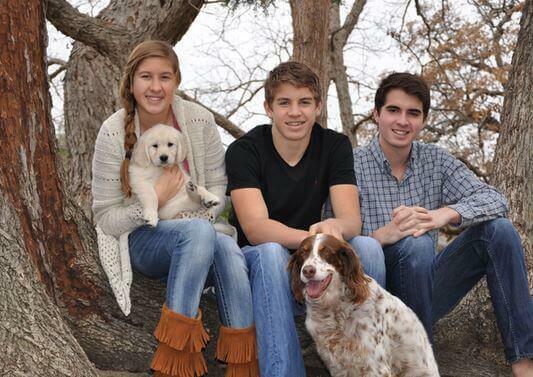 These dogs are also renowned for their patience with children. Because of their loyal and gentle temperament, golden retrievers are also popular family pets. Golden Retrievers possess a friendly, eager-to-please demeanor, and are the third most popular family dog breed (by registration) with AKC in the United States. The muzzle of the British type of dog is wider and shorter, and its forehead is blockier. It has shorter legs, with a slightlydeeper chest, and shorter tail. Its features make it generally heavier than the American type Golden Retriever. Males should be between 56–61 cm (22–24 inches) at the withers and females slightly shorter at between 51–56 cm (20–22 inches). Their weight, however, is not specified in the UK standard. The Golden Retriever KC(from England) standard calls for a level topline and straight hindquarters without the slight rear angulation found in American lines.The eyes of the European type are noted for their roundness and darkness as contrasted with the triangular or slanted composition of their American counterparts. A Golden Retriever of British breeding can have a coat color of any shade of gold or cream; however, red or mahogany are not permissible colors. Originally cream was not an acceptable color in the UK standard; however, by 1936 the standard was revised to include cream or white(as some call it). It was felt this exclusion was a mistake as the original “yellow” retrievers of the 19th century were lighter in color than the then current standard permitted. As with American lines, white is an unacceptable color in the show ring. The British KC standard is used in all countries with the exceptions of the USA and Canada. Some breeders of this type in America may import their dogs to improve the temperament and health noted in those bloodlines . 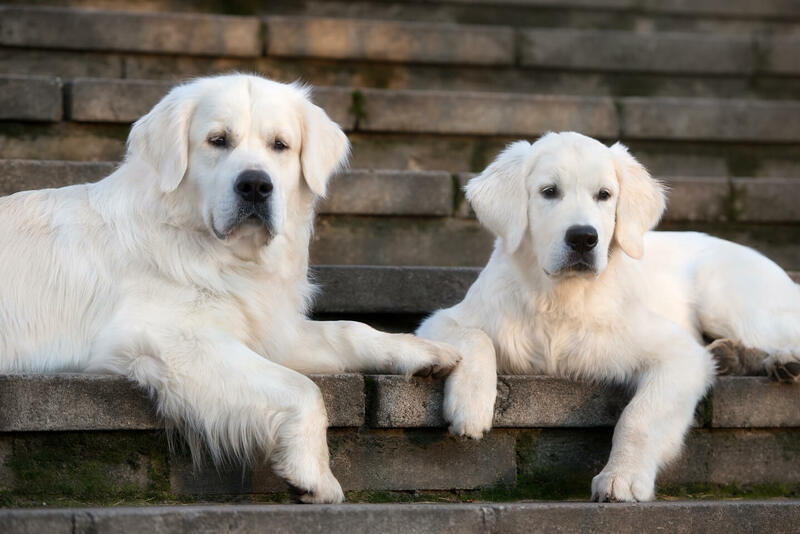 The English Golden Retriever have a muscular body with great endurance built for hunting.Some variations do exist between the American and English Golden Retriever in their standards and bloodlines. The English or British type standard is based on the KC(Kennel club of England) and the American is based on the AKC standard. 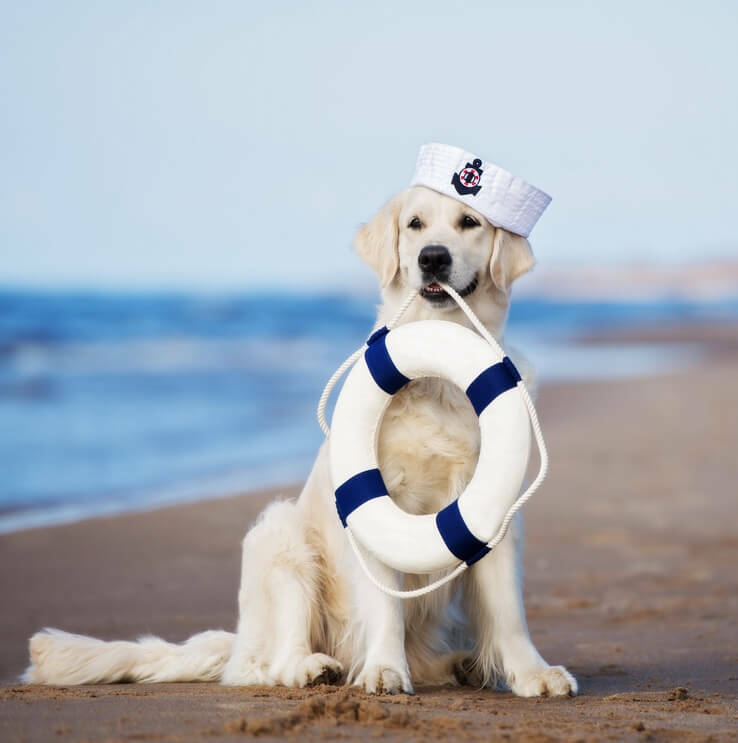 Cancer is the main cause of death in American golden retrievers, according to the 1998 health study conducted by the Golden Retriever Club of America(GRCA). Cancer accounts for 61.8% deaths from with American golden retriever bloodlines, whereas 38.8% for English Golden bloodlines. The KC(Kennel Club in England), did a study of English bloodlines to account for this percentage. That is a significant difference between the two. The most common types of cancers are henamgiosarcoma, lymphosarcoma, mast cell tumor, and osteosarcoma. Because of this big difference, it is the greatest reason for a buyer to consider an English cream golden retriever puppy. This means that an English golden retriever usually lives about 1yr and 7months longer than an puppy from American bloodlines according to these studies. You wont go wrong with a English Golden retriever.. They make the best all around dog, whether its for a family with children, the athlete wanting a running buddy, seniors wanting a new companion, or really just anyone will love having one. They are very patient and tolerant more than any other breed. They are loyal, friendly, tolerant, patient, easy to train, smart and beautiful. They are “people” dogs. He’ll love going outside for a run, but if you go inside, he will expect to also. A English Golden Retriever wants to be a member of the family and expects to be treated as such. 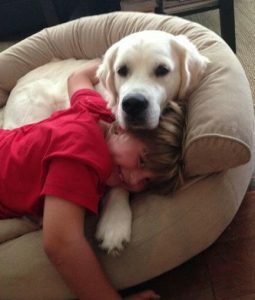 You will find more and more, English Golden Retrievers being used as theapy dogs for hospitals, nursing homes, and schools. They are known for their calm disposition and loving nature. Not all English goldens are calm, there are exceptions, but in general they are much calmer than ones from American bloodlines. We have several of our pups that have gone on to be therapy dogs and registered service dogs. They make excellent dogs to visit nursing homes and childrens hositpals. They are used for victims of PTSD. And the latest treatment is for children with night terrors and autism. 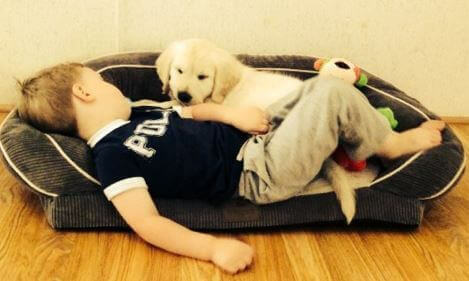 The English Goldern Retriever will sleep with the child and when they wake up in terror, go right back to sleep with the comfort of their best fur friend laying there with them.. This saves parents night after night of no sleep. Goldens are being used for some many different medical treaments , there is no end to their many many benefits. Pets provide other intangibles. “Dogs and other pets live very much in the here and now. They don’t worry about tomorrow. And tomorrow can be very scary for an older person. By having an animal with that sense of now, it tends to rub off on people,” says Dr. Jay P. Granat, a New Jersey psychotherapist. There’s nothing like the bond between a man and his dog. 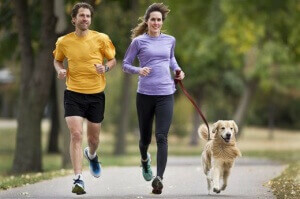 But, for a runner, dogs offer far more benefits than simple companionship. Having a dog for a running partner provides extra motivation to get out and run. And having Fido around offers a measure of protection while running, from animals of both the human and non-human varieties. Golden retrievers are well loved for their friendly dispositions and moderate to high energy levels. A well-trained retriever can make the perfect companion for a slow, long run. All in all, you just can’t find a better family dog than a. They’re smart, gentle, and sweet, and their only desire is to be the best friend of everyone in your family. They love the water, hiking, playing catch, riding in the car, just whatever you are doing they will be by your side.. They have been taught to surf, be seeing eye dogs, police dogs, companions to the elderly, therapy dogs, PTSD dogs, and most of all the best family dog you will EVER have. Click here to see what puppies we have available here.